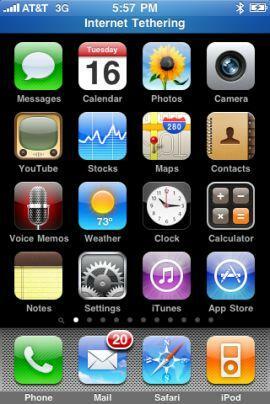 Apple has built Internet tethering capability to iPhone, iPhone 3G and iPhone 3G S in its newest iPhone OS software 3.0. 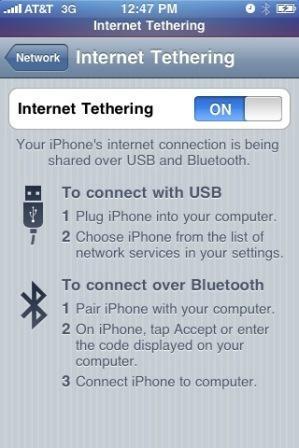 Internet tethering allows iPhone owners to use iPhone as wireless modem or dongle device to connect the PC or notebook computer to Internet for surfing and browsing. However, for commercial purpose, Internet tethering is disabled or blocked by default, as most mobile network carriers or operators want to charge extra fee for Internet tethering privilege, although existing service plans already allow certain limited bandwidth or even unlimited amount of data downloads. Instead of paying excessive amount of money (most in the high 10s) in addition to the already-overpriced iPhone plan price, there was a fews hacks to enable Internet tethering on jailbroken iPhone previously. With built-in support for Internet gateway tethering in iPhone with the release of iPhone OS software 3.0, there is a very simple hack for iPhone OS 3.0 upgrader to enable Internet tethering, without paying anything extra or subscription fee to the mobile operator, and without jailbreak or unlock. 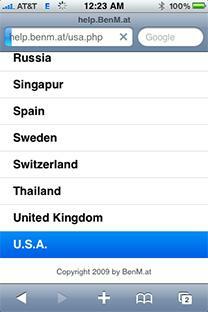 Run Safari mobile web browser on the iPhone. Optional: If you want to generate your own mobileconfig with custom APN, username and password with Mobileconfig Generator, visit http://help.benm.at/help.php. In most case, just visit the next link directly, as the configuration files for most mobile carriers around the world have been prepared. If you’re following this link, click on Mobileconfigs. Select your mobile service provider. 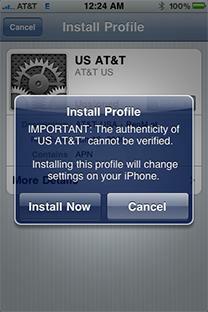 Tap Install to install new profile. Select Install Now to download and install new profile. 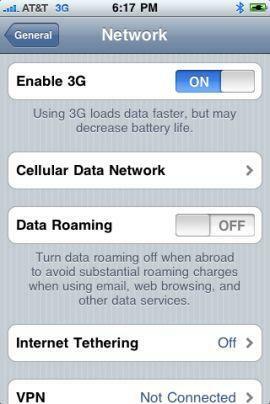 On iPhone interface, go to Settings -> General -> Network -> Internet Tethering. Set Internet Tethering to On. 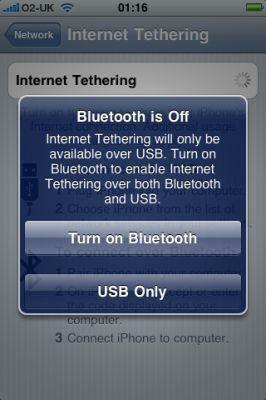 If prompted that Bluetooth is off, select Turn on Bluetooth or USB Only according to your preference. Internet tethering is enabled, connect iPhone to PC computer via USB or Bluetooth to start connecting to Internet though iPhone as tethered Internet gateway modem, with typical mobile broadband connection speed, normally up to around 1.4 Mbps. Meanwhile, iPhone will glow blue too. Note: Tethering computer through USB to iPhone to access Internet is much easier. Normally, Windows or Mac system will automatically recognize the tethered iPhone, and create require network connection to take advantage of the shared Internet access via iPhone. For Bluetooth connection, other than usual pairing, user also has to select “Connect to Network” from the Bluetooth device option in order to access the Internet from desktop or notebook/laptop computer via tethered iPhone. Actually, the hack can be performed manually by iPhone owner himself or herself. The profile download link above provides easiest and most convenient way to activate and enable Internet Tethering without hassle though. 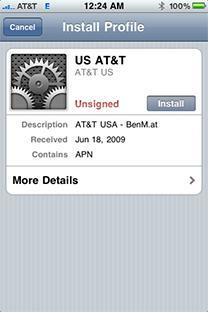 BenM.at is gathering all these publicly available information such as APN (access point name) and password for the iPhone for many network across the world, and create a XML based profile by using Apple’s iPhone Configuration Utility. The hosted iPhone tethering configuration profiles is pushed to the handsets of iPhone users who download the profile, and instant activates the tethering system free of charge. After downloading and installing the new Internet tethering enabled profile, some users may report MMS and/or VVM (Visual Voicemail) problem, where MMS or Visual Voicemail stops working. To fix the MMS and VVM not working after enabling Internet tethering error, go to Settings -> General -> Reset -> Reset Network Settings. After the short reset, iPhone should be able to be used for MMS, Voicemail and Internet tethering.